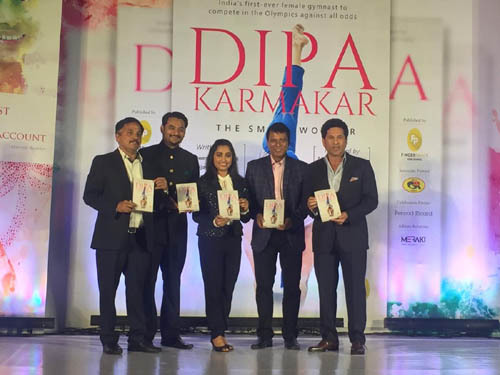 Cricket legend Sachin Tendulkar on Tuesday launched ace gymnast from Tripura Dipa Karmakar, autobiography titled ‘The Small Wonder’. The book launched at an event in Mumbai, narrates her struggles which was co-authored by journalist Digvijay Singh Deo among other contributers. According to a report in a national media, Praising the gymnast on her Olympics feat Tendulkar said “not only she left an impression, but also motivated thousands of youngsters to go out and do something special for our country and that is what matters”. The 25-year-old gymnast came into the limelight after finishing at fourth place in the Valut event at the Rio Games. Karmakar said she was preparing for the 2020 Tokyo Olympics qualification. “I will be competing in Olympic qualification event in March. Now the criteria for qualifying has changed drastically,” she said. “It is very tough for countries like us, who are not developed in gymnastics. But, I am preparing and trying my best (to get that qualification).” Karmakar shared several anecdotes about her coach Nandi and also spoke about the contribution of Dr Anant Joshi, who operated her following the knee injury.